Who would want to steal the Gold Plates? Well, anyone would! 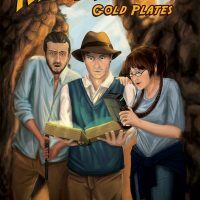 Moroni Smith, Orrin Porter Rockwell VII and Gadget Gunderson, of the Church Special Projects division, are engaged in yet another fingernail-biting adventure as they try to recover the stolen Gold Plates from a splinter faction claiming divine right and stewardship of those legendary Plates. Their adventures take them from the rocks and caves of Southern Utah to the lush hills of the Finger Lakes District in New York state as they follow the trail left for them by the megalomaniacal leadership of The Brethren of the Lord. “What’s the sign we’re looking for?” I asked. I had to practically yell to be heard above the sound of the river’s rushing water. I had asked the question more to calm my own nervousness than to get an answer. I looked up at the sheer sides of the rock walls that rose above us. There was something about being out in the open like we were that caused me great anxiety. I shouldn’t have worried. I was in the very capable hands of the direct descendant of Porter Rockwell, Joseph Smith’s legendary bodyguard. If there was anyone I could feel safer with, I didn’t know whom. And what aid Port couldn’t give with his wit and strength, Gadget could with her intelligence and her electronics. And, to top it off, they were my two best friends in the world. A mosquito suddenly nipped me on the ear. I slapped the side of my head and as my hand came away, I noticed it was covered with blood. Then I heard the gun shot. I heard a second shot and felt it whiz past my face. I could tell by the angle of the bullet that it had come from somewhere to my right. I rolled, drawing my own gun, and got off a random couple of shots. I didn’t know if they hit anything, but it would make our attackers sit up and take notice. I heard another gun report over my right shoulder and knew that it was Port firing.